Walid Shoebat is a fraud, a wolf in the church, who is being used to deceive Christians. Walid is a Roman Catholic like his wife and he points to Islam as the enemy, to deflect blame away from the Popes of Rome, which the Protestant Reformers rightly identified as the antichrist beast of Revelation, the Little Horn of Daniel, and the Son of Perdition. Revelation 13 describes the leaders of the Roman beast, the Popes of Rome, and the Jesuit General. Revelation 17 describes the Catholic Church, with her purple and scarlet colors, and golden cup. Islam fulfills Bible prophecy, but it is not as the antichrist beast; it is the clay in the iron/clay feet of the statue in Daniel 2, which the Popes control to carry out their agenda. Radical Muslims are an enemy to be sure, but they are ultimately controlled by the Jesuits of Rome through the CIA. Of course, Walid isn’t telling you any of that. Wikipedia, the Jerusalem Post, CNN, the Military Religious Freedom Foundation, Reporter Eileen Fleming of WeAreWideAwake.org, and many others, all proclaim that Walid Shoebat is a fraud, who is making lots of money by promoting hate towards Muslims. Many Christians are embracing his message because some Muslims leaders oppose the Zionist state of Israel, and because some radical Muslims are killing Christians. The deceiver is pitting Christians against Muslims, and Muslims against Christians. The enemy is pushing the world towards WW III, which will pit christian America and Israel, against Muslims countries, where many on both sides are killed. The enemy is causing strife between religions, so that in his New World Order, people will long for a one-world religion, that joins everyone together in the name of peace. The deceiver is using people like Walid Shoebat to promote hatred towards Muslims, which will lead the world into WW III, when Muslim countries and Israel will attack each other. 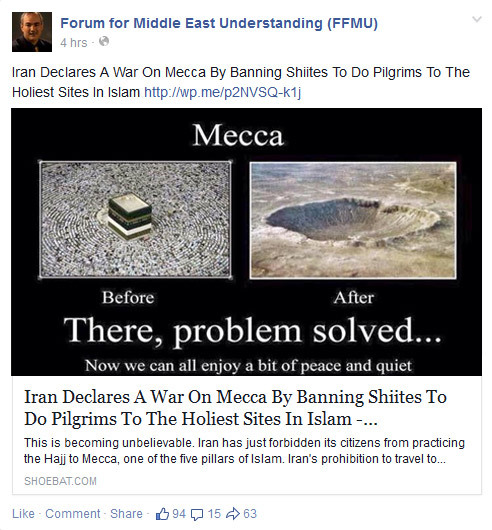 On this Facebook post, Walid is promoting wiping out Mecca and Muslims, as a peace solution. Mikey Weinstein, founder of the Military Religious Freedom Foundation, calls Shoebat a scandalous outrage. Weinstein expressed anger at the fact that not only had Shoebat been paid with federal tax payer funds for his speaking appearances, but that he had also been present at an event organized by the Department of Defense. When you look at his claims about being an ex-PLO terrorist, he is exposed as a fraud. But his family says that he was never in the PLO. Shoebat claims that he threw a bomb at Bank Leumi, an Israeli bank, in Bethlehem. But the police and the Tel Aviv headquarters of Bank Leumi have no record of a firebombing at its now-demolished Bethlehem branch. In addition Shoebat’s uncle also denies that such an attack took place. Shoebat claims that he was held in an Israeli jail ‘for a few weeks’ for inciting anti-Israel demonstrations. But the police say that he was never held in jail. The Jerusalem Post states that Shoebat has profited from his story that he was formerly a Muslim terrorist who has rejected Islam for Christianity. When the Post asked Shoebat whether the Walid Shoebat Foundation is a registered charity, he said that it was registered in Pennsylvania. The Pennsylvania Attorney General’s Charitable Trusts and Organizations Section said it had no record of such a charity. When asked again, Shoebat claimed it was registered under a different name, but that he was not aware of the Foundation’s registered name, nor any other details, which were known only to his manager. The Jerusalem Post grilled Shoebat over his claims and the fact that the purported bombing attempt was never reported in the media at the time. Cornered, Shoebat answered that he wasn’t aware of any coverage as he had “been in hiding for the next three days”. The report found that according to Israeli government officials, the bank that Walid Shoebat claimed to have attacked, and his own relatives, no record of his supposed terrorist history existed. A two-week term in an Israeli jail, another of Shoebat’s claims was also unsubstantiated, with Israel having no record he was ever jailed. His cousin, interviewed in the report, stated that he had never known Shoebat to have ties to any movement, and that his claims of being a former terrorist were “for his own personal reasons”. Walid Shoebat teaches that all Muslims should be suspect and profiled. He teaches that they must be eliminated. His teachings against Muslims are not of Christ, for you shall know them by their fruit, and his is one of rotten fruit of hatred. This stands in direct opposition to what our Lord taught us. The world sees Christians hatred towards Muslims and not the love of Christ. Christians blindly trust Shoebat because he claims to be a Christian. Walid Shoebat was born in Bethlehem, raised in Jericho in a strong Muslim family. When he “converted” from Islam to Christianity, it was through the Roman Catholic Church. Please understand that most Catholics believe in salvation by works through the Papal Church, which is not true salvation. If you’ve read any of the studies on the website, then you know that the top leaders of the Catholic Church are the antichrist beast of Revelation 13, the Little Horn of Daniel 7, and the office of the Papacy, is the Son of Perdition of 2 Thessalonians 2. “The Vatican has been slandered for centuries without a shred of biblical evidence. They call it the Harlot of Babylon, the killers of the saints, the woman drunk with the blood of the martyrs of Jesus Christ. And for historic evidence they say that the Catholic Church eliminated the Manichaeans, Arians, Cathars, Priscillianists, Paulicians, Bogomiles and Albigensians. But look at what Walid is saying by proclaiming that these people groups were not Bible believing Christians. He’s saying that it was okay for the Catholic Church to kill people whom they deemed as heretics. Show me the Bible verse that supports that. It’s ironic that he wants proof that the Roman Catholic Church caused millions of Christians to be killed, but there is no proof that he was an ex-PLO terrorist. Let’s focus on the bigger picture, so that we can see the truth about the deceptions of the enemy. The Jesuits of the Roman Catholic Church are using the United States Intelligence agencies and military, to overthrow the leaders of countries and to bring them into submission to the New World Order. While doing this, they are causing Muslims to hate ‘christian’ America, so that it seeks revenge. During the Iraq wars, 100’s of thousands of Iraqi civilians were killed. The military used depleted uranium in the munitions, which is now causing massive cases of cancer and birth defects. They demonized Muammar Gaddafi to justify removing him from power and killing him. Gaddafi nationalized their oil resources to fund free education, waterways to provide access to clean water, support to farmers to grow food for the country, and he was the protector of South Africa. Now the country is desolated and the Libyan people are suffering, under the control of the Muslim Brotherhood. Syria is being demonized, falsely accused of using gas on civilians, etc. Before it was a place of peace where 5% of the population was Christian. Now it is war-torn and many Syrians line up every day for food. And the Christians are being displaced and persecuted. Obama empowers the military to drop drone bombs on Pakistan and other countries, under the guise of killing suspected terrorists; but for every target, 10 civilians are killed. The point is that these actions are causing Muslims to hate christian America, so they kill Christians, as it’s their only way to exact revenge. The Jesuits use the intelligence agencies and military of the United States, to train, fund and arm, the Sunni Al Qaeda and ISIS rebels. They use them to cause chaos in countries that they want to take control of, they use them to kill Christians and Shiite Muslims, and they use them to cause Christians to hate Muslims. So it is the Jesuits who are using the Muslims rebels to kill Christians. But Walid isn’t telling you that, because he is married to a Catholic, and he no doubt is a servant of Rome. Can you see how both Muslims and American Christians are being played by the deceiver, to promote his goals? Walid Shoebat points to the Muslims as the enemy, as the antichrist system. But the truth is that the Jesuits of the Roman Catholic Church work behind the scenes, to cause Muslim radicals (Al Qaeda operatives) to kill Christians. The Jesuits also control America and its military, so they are pitting these two forces against each other using the Hegelian Dialectic, in order to create their desired outcome, their New World, where there is only one religion. Walid manipulates Bible prophecy to point to an Islamic antichrist. In referring to the third trumpet of Revelation 8:10, Walid teaches that it is pointing to Islam. But the true fulfillment of the third trumpet of Revelation 8 represents our Lord sending Attila the Hun to war against the Roman Empire. A star in prophecy symbolizes a leader. God sent this great burning star, Attila the king of the Huns, who was called “the scourge of God.” He came from the area around a river in Illyricum which in Greek is called “Apsynthos” (Wormwood). Attila and his 800,000 man army rose quickly and flashed across the land in 451 A.D., and desolated the Italian Alps, which is the source of the Danube, Rhine and Po rivers. Read about the fulfillment of the Revelation seals, trumpets and bowls. Walid says that the Ottoman Empire will be re-empowered to be the antichrist beast 2, but the Word of God say that the Ottoman Empire would be dried up in the 6th bowl of Revelation. The 6th Bowl was poured out to dry up the Ottoman Empire, the people (river) of the Euphrates who had been released during the 6th Trumpet. During the 18th and 19th centuries, they lost control of the territories that they had occupied, such as Syria, Jordan, Iraq, Saudi Arabia and Kuwait. They lost control of Palestine to General Allenby of Great Britain in 1917 A.D. He teaches that salvation by “faith alone” was from the Roman Catholic Church, not the Protestant Reformers. And the fulfillment of Revelation 11, is when the Lord had Martin Luther read the Holy Scriptures, to see who was the true church and the false church. Luther found that the message of salvation by the sacraments through the Papal Church was not true salvation, and that they were in fact Gentiles who were delegated to the outer court of the Temple of God, the Church of Christ. They were the false apostate Church, a Harlot Church. Read The Two Witnesses of Revelation 11 Bible Study. He teaches that all roads lead to Turkey, not Rome, as to deflect blame away from them. But Daniel, 2 Thessalonians 2 and Revelation, clearly describe the Roman beast as the antichrist beast of Revelation, the Little Horn of Daniel, and the office of the Papacy, the Son of Perdition. He defends the Catholic Crusades, calling them Christian Crusades, and is calling for more Crusades in the name of Christ. But the Crusades are a Roman Catholic Church thing, NOT a Christian thing. The Roman Catholic Church empowered the Muslims to go conquer Jerusalem, and to kill Christians and Jews. The Muslims were supposed to turn Jerusalem over to the Pope, but they did not, and instead built the Dome of the Rock. They Muslims conquered part of the old Roman Empire, which was primarily Catholic or Orthodox, both of which believe in salvation through the sacraments, and both revere Mary as their intercessor. So they were not true Christians. The religion of Catholicism has killed more people than the religion of Islam. Historians estimate that the Roman Catholic Church killed over 50 million ‘heretics”, mostly Jews and true Christians. Here is what Walid Shoebat and his son Theodore are not telling you. The Roman Catholic Church helped Mohammed become the leader of Islam and they helped write the Qur’an. The iron/clay feet of the statue in Daniel 2 is the Roman Church and the Arabs, which both have historically killed Jews and the true followers of Christ. Read this new Bible prophecy study called Islam In Bible Prophecy. Walid’s son Theodore Shoebat is a Roman Catholic who is following in his footsteps of manipulating Scripture to point to Islam and Muslims. UPDATE: The following videos were removed from YouTube by Theodore, as they prove that he is a rabid Catholic, and defender of the Pope. I left them on this page so that you can see what the topic was, and that he removed them. In this video he says that the Virgin Mary is involved in warfare. In this video he defends the Roman Catholic Eucharist, which proclaims that the wafer becomes the literal body of Christ. In this video Theodore defends the Catholic icons/idols. Here he defends praying to the souls of saints. In this video he proclaims that Mary will return with Jesus at the second coming. Clearly he is a Catholic who will never tell you the truth, that the Jesuits of Rome are the enemy of Christ and His followers. Theodore promotes militant behavior and a new Crusade to kill Muslims. Let’s be really clear about something. If a Muslims kills a Christian, then the sovereign Lord allowed it, and that martyr will be honored in Christ’s kingdom. If Muslims overrun America, then the sovereign Lord allowed it, as He consistently uses pagan people groups to execute His judgment on His disobedient people. We are called to stand up against the evil system and expose the antichrist beast. We can defeat the enemy with the truth of the Word of God, which is the rod of iron. But please stop promoting a culture of hatred of any people group, whether it’s Muslims, Jews, or any other. When you put all the facts together, Walid Shoebat is a liar about being an ex-PLO member; he is a defender of the antichrist Roman Catholic Church; and he is promoting a doctrine of hatred of Muslims. His fruit is rotten and no Christian should have any part of him, lest they partake in his deception. Please share this page with others to expose him. To learn who the antichrist beast of Revelation is, which makes war with Christians, read the End Times Deception home page. That is a lot of information on Walid but I always estimate my character references on the person themselves. CNN are about as credible as the mythological flying spaghetti monster that atheists are always so intent on replacinGod with. That is until they develop a relationship with God. You should try forming a relationship with Walid, his fruit is good! And you are one of the Fools. Walid is as solid as they come. And he knows the Bible far better than 99.9 % of Christians including you. I have been watching hi9m long before he came onto the scene. And it proves that it’s you who have been fooled by the enemy. Did you bother to read anything this author stated? I was just on his website and he deliberately lies about Trump, immigration, our national emergency etc.. He still sounds like a Muslim by his adovcations. It’s the hidden Muslim in him that hates and deceives. He is making money off it now. Can you quote me a single verse from the entire Bible (without adding your interpretations) which says that the Anti-Christ will come from Rome? Also explain me why is God continuously speaking about destruction of Islamic Nations as a main event of End-time Prophecy in Isaiah 63, Joel 3, Zechariah & Ezekiel? Can you quote me a single verse from the entire Bible (without adding your interpretations) which says that the Anti-Christ will come from a Muslim country? As for the destruction of Islam/Muslims, they are the ‘clay’ of the iron/clay feet of Daniel 2. The Roman beast helped write the Quran and prop up the illiterate Mohammed as its prophet. The Roman beast has used Muslims to kill Christians and Jews, and to conquer territory. So they will be judged accordingly when Messiah returns to cast a stone at the feet of the iron/clay feet, at the Roman/Islamic armies. YOU ARE FULL OF CRAP AND LIES. ONLY THE IGNORANT LISTENS, BECAUSE OF ZERO KNOWLEDGE. LOVE U NO MATTER IF U ARE IGNORANT. ACTUALLY, U MAY BE A FRONT OF LIARS, GENERATED BY THE FATHERS OF LIARS, SATAN HIMSELF. IT WON’T DO ANY GOOD TO RESPOND, BECAUSE TRUTH IS AVAILABLE IN THE WORD OF ADONAI. PLAIN AND SIMPLE. It’s ironic that you say that truth is available in the Word of Adonai, but you fail to understand it. Prophecy fulfillment is plain and simple, yet here you are cursing and making accusations; but it is you who is ignorant. The Rev 13 beast is described as the Leopard-Bear-Lion – The combination of the Grecian, Persian Babylonian empires which stretched from India to Greece, Afghanistan, Iran, Iraq, Arabia, Egypt and the northern African City States. Here we have the geographic location of the beast empire (Ottoman) who received a deadly wound (1924). The deadly wound is in the process of being healed via Turkey and Erdogan Every verse in Rev 13 describes Islam, not Rome. Rev 17: the beast that was [Ottomans], and is not [Islam since 1924] and yet is [in spite of a deadly wound, the beast area as defined by the LBL is still totally Islamic]. I could go on but this is not the place. Pope Francis seems like a Dolt under which the Catholic Church seems to be weakening. Now, you could be correct though – prophecy can be surprising in its outcome. Isaac, Daniel foretold four beast kingdoms which would endure until Messiah returns: Babylon, Medo-Persia, Greece and Rome. John is pointing to the Roman Empire, by noting that it had succeeded the previous three kingdoms. The deadly head wound happened when the last Western Roman Emperor was removed from power in 476 A.D. When the antichrist Popes of Rome were given civil and ecclesiastic authority in 538 A.D., the took the Emperor’s title of Pontifex Maximus, the leader of the church and state; and thus, the deadly head wound was healed. Walid goes against the grain of popular end of days with Islam being the real enemy instead of the Pope. I used to believe this Pope version also until one day I asked the Lord to show me how to understand Revelation. Many currant and past scholars back Walid’s end time beliefs. Go back through history, keep the American prophecy predictions out of it. And suddenly you realize the Bible is a Mideastern Book written by Jewish men in Eastern lands about their ancient lands and what will become of them. Walid makes it very simple to understand and see the truth if you are willing to let go of your Americanized version view. He does not hate the Muslims, stop reading sound bites and line up what he says with your Bible. Yes, he is Catholic, I am a Baptist, we have differences, place Yeshua, Jesus in the center of your salvation experience and He will lead you. LJW, my explanations are counter to the American prophecy predictions. My explanations are those of the Protestant Reformers and the great theologians of the 16th-20th centuries, most of whom lived in European countries. Man, have you been brainwashed by fake historians…Give me one primary source, idiot. It’s pretty obvious why apparently support Walid Shoebat’s prophecy fulfillment explanations, because they deflect blame away from your antichrist Popes and your harlot church. It’s ironic that you can me an idiot, when you’re in the harlot church of Revelation, and you revere (mark on forehead) and obey (mark on right hand, actions) the antichrist Pope of Rome; so you have the mark of the beast. I’m not part of a Protestant Church, thanks. I just protest against your Pope and church. Judgment if coming Robert. Messiah said to come out of her, lest you partake in her plagues. I pray that you heed his warning. Maybe what you publish is tacquiya. Yes, it is ok for Muslims to lie in order to further their cause. Walid Shoebat is a Catholic and he is lying to you, in order to deflect blame away from the antichrist Pope and false prophet Jesuit General. I have witness with my own eyes the horrible treatment of women in Muslim countries. I had occasion to spend time in Saudi Arabia, UAE, Bahrain and Morocco while I was in the Air Force. I was schocked to see a site that professes to be about Christianity beliefs, defending Muslims! What is it about genital mutilation that is ok with you? It’s common in Islamic culture. What is it about honor killing that is ok with you? I saw with my own eyes, a woman (probably mother) riding in the back of a pickup truck with a camel while temperatures were above 110 degrees F. A man, possibly her husband, and a male youth, possibly her son, rode in the air conditioned cab, seemed to have a great time, while her clothes were soiled by the camel. Of course she was covered from head to ankle in black attire. I implore you to think about these facts as you defend the behavior of Muslims in the western world. Eroc, this article does not defend the evil actions of Muslims!!! It simply proclaims that the antichrist Popes and false prophet Jesuit Generals are the real enemy of Messiah and His saints. They use the Muslims to carry out their evil agenda. What Walid Shoebat teaches about prophecy fulfillment is false, and it deflects blame away from the antichrist Pope and false prophet Jesuit General. And why would he do that? Because he’s a Catholic, who serves his masters in Rome. Do you see me supporting Islam? No. It says right on the top of the page “This report in no way supports the actions of radical Muslims.” And yes, their false religion needs to be exposed. This page simply shows you how what Walid is teaching about Bible prophecy is false. I’m no giving “wong-bat’ one shred of attention; if what you ‘re saying is true he’s a classic sociopath which wouldn’t be a surprise. If he isn’t, who cares what he says. I only stumbled accidentally upon a website with his name on it; for entertainment purposes only.Okay for an hour, moving on. I desire nothing but to Know Christ and Christ Crucified. Not what a Vicar of of Christ who goes by the title Holy Father…says…who insists on the wafer god who thinks other can vicariously drink his blood through him. Ridiculous..but if people got sucked into trusting hitler I suppose anything is possible.